Valentine’s Day. Was thinking about asking the girl I like out, but she said early this week she didn’t have the luxury to go to the annual CNY market this year, I’m just assuming she’s busy today as well? Or is she dating someone else? Actually, does she have a bf? How can I be certain without asking directly? Love is so complicated! 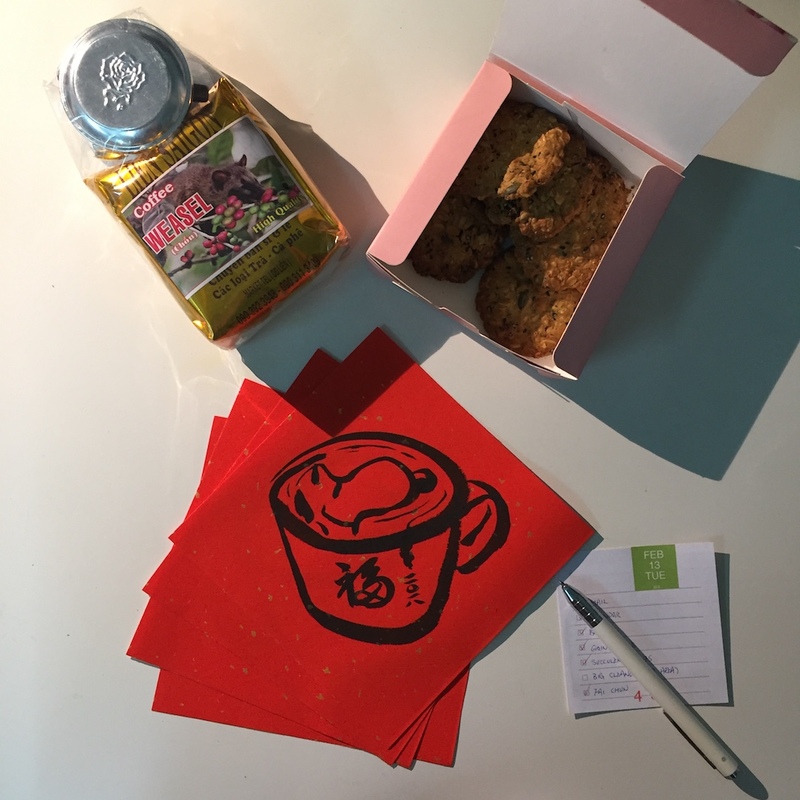 During my weekly calligraphy class yesterday, I gave out my fai chun and my classmates brought me coffee from Vietnam and homemade cookies. My 89-year-old classmate even treated us for a lunch buffet! I know the events were not directly related and that I didn’t receive free coffee, cookies, and lunch because of my artistic fai chun. But the idea stuck and I started pondering the possibility of exchanging art for food. How about opening a cafe where a (starving) artist can exchange art for bread and coffee? Finished cleaning up the art area in the studio this afternoon, I really hope to spend more time there behind the drawing board making quality art this year. But I still can’t really figure out how I can sustain myself financially doing art, is there a way I can consistently exchange my art for food so that I don’t starve to death? Oh Lord, may You continue to guide my steps and help me understand Your plan in my relationships and career.